Four-in-one this week! These four reminders -- slogans to try to live by -- fit together, and bring us back down to earth. If spiritual teachings are to really transform our lives, they need to oscillate between two levels, the profound and the mundane. If practice is too profound, it's no good: we are full of wonderful inspiring, lofty thought, insights and speculations but lack the ability to get through the day with any gracefulness or to relate to the issues and people in ordinary life. We may be soaringly metaphysical, movingly compassionate, and yet unable to relate to a normal human or a worldly problem. This is the moment when the Zen master whacks you with her stick and says, "Kill the Buddha!" On the other hand, if practice is too mundane, if we become too interested in the details of how we and others feel and what we or they need or want, then the natural loftiness of our hearts will not be accessible to us, and we will sink under the weight of obligations, details, and daily-life concerns. We need both profound religious philosophy and practical tools for daily living. This double need, according to circumstances, seems to go with the territory of being human. First, do good. Do positive things. Say hello to people, smile at them, tell them, "Happy birthday!" or "I am sorry for your loss, is there something I can do to help?" These things are normal social graces, and people say them all the time. But to practice them intentionally is to work a bit harder at actually meaning them when you do them, to actually cultivate a sense of caring and feeling for someone else that is as real as you can make it, paying attention to what you say, how you say it, and how you actually feel it, or don't. We genuinely try to be helpful and kind and thoughtful in as many small and large ways as we can every day. From a religious point of view, doing good also includes wholesome religious acts like chanting a sacred text, studying, meditating, or giving money and other gifts to the spiritual community. All of these intentional positive actions, directly religious and not, generate virtue. They create a positive attitude in the mind or heart that will strengthen us for the good. Second, avoid evil. Pay close attention to our actions of body, speech, and mind, noticing when we do, say, or think things that are harmful of unkind. Having come this far with our mind training, we can't help but notice them, we feel bad. In the past we might have said to ourselves, "I only said that because she really needs straightening out; if she hadn't done that to me, I wouldn't have said that to her. That's why I did it, it really was her fault." But now we see that this was a way of protecting ourselves (see "Stop Blaming"). Now we accept responsibility fr what we have done. I'm not speaking of terrible things. Most of us probably do not do terrible things on purpose. This practice mostly references unkind thoughts or words that do not seem so bad and yet erode our sense of integrity if we don't pay attention to them. So we do pay attention to what we say, think, and do -- not obsessively, not with a perfectionistic flair, but just as a matter of course and with generosity and understanding, and finally we purify ourselves of most of our ungenerous thoughts and words. Third, appreciate your lunacy. 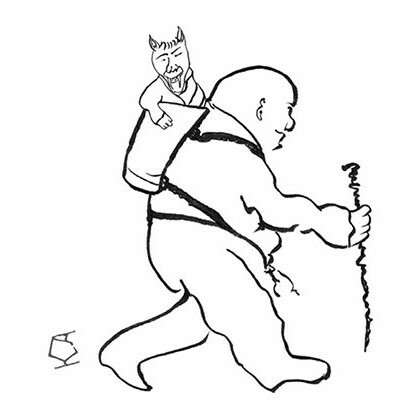 Indo-Tibetan Buddhist practice includes making offerings to demons. Psychologically, it's the same idea: bow to your weakness, your own craziness, your own resistance. In fact, congratulate yourself for them, appreciate them. Truly it is a marvel, the extent to which we are selfish, confused, lazy, resentful, and so on. We come by these things honestly. We have been well trained to manifesst them at every turn. This is the prodigy of human life bursting fort at its seams. It is the effect of our upbringing, our society, which we appreciate even as we are trying to tame it and bring it gently round to the good. 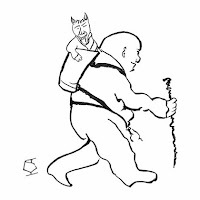 So we make offerings to the demons inside us, we develop a sense of humorous appreciation for our own stupidity. We are in good company! We can laugh at ourselves and everyone else. Fourth, pray for help. Pray to whatever forces you believe in -- or don't believe in -- for help. Whether you imagine a deity or God or not, you can reach out beyond yourself and beyond anything you can objectively depict and ask for assistance and strength for your spiritual work. You can do this in meditation, with silent words, or out loud, vocalizing your hopes and wishes. Prayer is a powerful practice. It is not a matter of abrogating your own responsibility. You are not asking to be absolved of the need to act. You are asking asking for help and for strength to do what you know you must do, with the understanding that thought you must do your best, whatever goodness comes your way is not your accomplishment, your personal production. It comes from a wider sphere than you can control. In fact, it is counterproductive to conceive of spiritual practice as a task that we are going to accomplish on our own. Remember: "Be Grateful to Everyone." There is no way to do anything alone. Not only does it make sense to pray for help, not only does it feel powerfully right and good to do so, it is also important to do this so that we remember that we are not alone and we can't do it by ourselves. Sometimes we forget this point and fall into the habit of imagining an illusory self-reliance. Do good, avoid evil, appreciate your lunacy, and pray for help. Simple everyday instructions. Jolkebuddha.com reports: "Johann Sebastian Bach wrote a great many musical compositions and had a large number of children. In between, he practiced on an old spinster which he kept up in the attic." The father of twenty children and one of history’s greatest composers, J. S. Bach epitomizes the juncture between music and paternity. The Two and Three-Part Inventions were written by Bach as a gift to his ten-year-old son Wilhelm Friedemann as a guide to mastering keyboard techniques and a model of polyphonic composition. In honor of Fathers’ Day, a group of these perennially beloved teaching pieces opens the morning’s Prelude. The CUUC Choir is on hand with a special valedictory offering for the final service of the “official” church year, along with anthems related to the monthly theme of Freedom and the eternal longing for peace. Tchaikovsky’s “June”, a seasonal offering written as part of a monthly commission for the St. Petersburg music journal Nouvelliste, rounds out Sunday morning’s music. that I "stuff my feelings, my spirit. I fast at least once a year, for three days at a time. I abstain from all solid food and limit myself to drinking fruit juices, herbal tea, and water. This juice fast prevents dehydration and provides many vital nutrients while still inviting me to abstain and feel that emptiness of body and openness of soul. When I fast, I pay greater attention to life. I am more mindful. 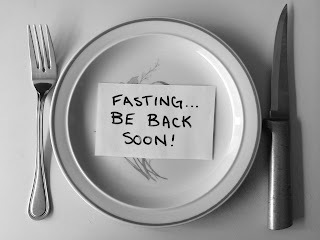 Some practice fasting as a time of repentance and self-sacrifice. For them, like other ascetic practices, fasting involves the denial or withholding of pleasure. But for me, fasting is not a form of suffering, because I do not find suffering in and of itself a useful spiritual discipline. Instead, I fast to make more room for God. When I want to deepen or reawaken my sense of the Spirit, it is helpful to let go of something else. When I fast, I create more room for God in my life, sometimes simply by the large amount of time that is freed from thinking about, shopping for, and preparing food. My hunger during the fast also serves as a visceral reminder of my own deepest yearnings. We are all hungry people. It is often difficult to be in touch with our spiritual hunger if we are satiated with food. Try to meditate on a full stomach! Often we stuff ourselves with food in a vain attempt to feed another kind of hunger that cannot be satisfied with food. Often we fill our hungers with food, with drink, with busyness, with distractions like television. Fasting is a time-honored spiritual discipline that awakens us to the deeper hungers within. During a fast we give up anything that has become a habit that might harm the body during the fasting period: caffeine, nicotine, alcohol, sweeteners o all kinds, drugs, and medicines, as far as possible. Fasting is not appropriate for people who battle bulimia or anorexia or those with special health problems. But fasting for a short period of time is healthy for most others. It cleanses the body of toxins. Some medical doctors have advocated fasting for purely physical health reasons. I find that the first twenty-four hours are the hardes physically. I can feel tired and have headaches. But there is a sense of freedom that comes to me on the second day. In the beginning of a fast many people are fascinated by the physical aspects of the experience. But more important is to monitor the attitude of your heart. Fasting is spiritual discipline known to every world religion. The Jewish calendar includes several fast days, most prominently the Day of Atonement or Yom Kippur, while Muslims fast between dawn and dusk during the month of Ramadan. In the Christian tradition, fasting was once a common discipline, continuing from the early church up to the Reformation. During the Middle Ages, it became associated with excessive ascetic practices involving rigid regulations and extreme self-mortification and thus fell into disfavor. In recent years, fasting has attracted renewed interest. Moses, David, Zoroaster, Kongfuzi (Confucius), Plato, Socrates, Aristotle, and Buddha all fasted for spiritual reasons. Like Elijah, who was fasting when he heard a still small voice, we are more open to the Spirit when we fast. And like Jesus, who was fasting when he was tested in the wilderness, we realize depths of faith and personal powers when we fast. Fasting reveals things that control us. We often cover up what is inside us with food. When we fast, these things surface. While fasting we may feel the sorrow, anger, regret, or pride we have been hiding from ourselves. Fasting is a way to bring awareness to what we do. Many of us eat for emotional comfort. It becomes an automatic impulse. Fasting helps us pay attention, and when we do, our relationship to things changes. We see more and see more deeply. We are present to the moment. Fasting helps us return to a balance in our lives. How easily we let the nonessential take precedence. How quickly we crave things we do not need. Fasting is a time to write in a journal, pray, meditate, walk. These are all ways of being receptive to grace. When fasting, it is helpful to keep daily concerns and distractions to a minimum. I do not watch television when I fast. Instead of relying on stimuli from the outside, it’s best to try living with yourself. Let yourself be directed from within. When fasting, do whatever does your body good. If you are tired, sleep. If you like physical activity, exercise. Do things that please you: read, dance, or listen to music. What was hardest about today’s fast? What was easiest? What surprised me about fasting today? In what ways did I become aware of the deeper hunger of my soul today? What were the inner demons I encountered today on this fast? What special grace did I experience today? You may give your fast a focus. Some people are mindful that two-thirds of the world go hungry every day. They fast as an act of concern and identification. The money saved from this experience goes toward hunger. I know of one person who was so struck by an insight into himself during a therapy session that he spontaneously observed a twenty-four-hour fast to help him remember and deepen that insight. Beginning and ending a fast is important. Gathering with others to observe a fast’s initiation and again to break the fast can be helpful. In one breaking-fast ritual I have participated in, we each brought a reading, a poem, or a passage that spoke to us during the fast. We also brought a piece of fruit. Silently, one by one, we approached the table and prepared our piece of fruit, placing the pieces on china plates, one for each person. One of us would slowly cut a banana and distribute slices to the plates. Another person would peel and divide the sections of an orange, and so on. When we all had gone forward in silence and prepared our fruit, we were left with a plate for each of us with an array of fruit. It was a wondrous offering of food. Slowly, mindfully, and with great intention, we broke the fast by tasting the fruit before us. And always after the silence of our meditation, there was laughter as we ate together. It was good. Church music through the ages is represented in Sunday morning’s Prelude by the juxtaposition of J.S. Bach’s Chorale “Jesu, Joy of Our Desiring” with “A Simple Song” from Leonard Bernstein’s Mass, written for the opening of the Kennedy Center. Elsewhere, the Affirmation of our Third Grade Class is marked by a duet performed by Tycho and Christian Force as well as excerpts from Robert Schumann’s Scenes of Childhood. The CUUC Choir is also on hand with a celebrated number by the Beatles as well as a medley of beloved African-American Spirituals. Read on for programming details.